Good pre-owned condition with noticeable wear and pilling. Still has lots of use left. Item color may vary depending on brightness and quality of your screen. I am not responsible for item colors looking slightly different in person. NIKE DRI FIT MOISTURE WICKING SLEEVELESS WOMENS SIZE XL POLYESTER/COTTON/RAYON FAST SHIPPING FROM CENTRAL LOCATION. GENERALLY SHIPS THE SAME BUSINESS DAY. Nike #620462 702 Dri-Fit Racer Back White with Green Speckles Polyester Cotton Rayon Dri-Fit technology wicks away moisture to keep you dry ​Women Size Medium FAST SHIPPING FROM CENTRAL LOCATION. GENERALLY SHIPS THE SAME BUSINESS DAY. The Nike® Women’s Futura Tank Top is a must-have workout staple. The slim fit design might look simple, but performance Dri-FIT® fabric kicks in at the first sign of sweat to help keep you dry and comfortable. Flat side seams move smoothly over your skin to prevent irritation, while a narrow racerback design allows for a full range of motion. Enjoy the clean, comfortable finish of the Futura Tank Top. FEATURES: Tank top Slim fit provides distraction-free comfort Dri-FIT® fabric helps keep you dry and comfortable Flatlock side seams help reduce irritation caused by chafing Soft binding around the neckline and armholes provide a clean finish Care Instructions: Machine wash FAST SHIPPING FROM CENTRAL LOCATION. GENERALLY SHIPS THE SAME BUSINESS DAY. Float through workouts in the Nike® Women’s Elastika Keyhole Veneer Tank Top. Crossback straps and a loose fit provide excellent mobility, while silky Dri-FIT® stretch fabric works to keep you comfortable and dry. Mesh front straps and a perforated Swoosh design trademark offer ventilation for cool comfort. The rounded hem helps to keep you covered as you breeze through training in the Elastika Keyhole tank top. Machine Wash. Material: 86% Nylon 14% Spandex. Pre-owned: Good Condition. Nike Dri-Fit Moisture Wicking Sleeveless Womens Size Medium FAST SHIPPING FROM CENTRAL LOCATION. GENERALLY SHIPS THE SAME BUSINESS DAY. NIKE DRI FIT SLEEVELESS WOMENS SIZE LARGE FAST SHIPPING FROM CENTRAL LOCATION. GENERALLY SHIPS THE SAME BUSINESS DAY. 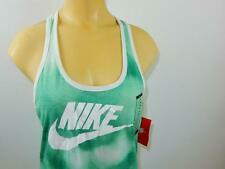 NIKE DRI FIT SLEEVELESS WOMENS SIZE XS FAST SHIPPING FROM CENTRAL LOCATION. GENERALLY SHIPS THE SAME BUSINESS DAY. NIKE DRI FIT MOISTURE WICKING SLEEVELESS WOMENS SIZE SMALL POLYESTER/COTTON/RAYON FAST SHIPPING FROM CENTRAL LOCATION. GENERALLY SHIPS THE SAME BUSINESS DAY. NIKE DRI FIT MOISTURE WICKING SLEEVELESS WOMENS SIZE MEDIUM 95% NYLON 5% SPANDEX FAST SHIPPING FROM CENTRAL LOCATION. GENERALLY SHIPS THE SAME BUSINESS DAY. Nike Dri-Fit Racer Back Orange/Lavender 100%Polyester Dri-Fit technology wicks away moisture to keep you dry ​Women Size Small and Large FAST SHIPPING FROM CENTRAL LOCATION. GENERALLY SHIPS THE SAME BUSINESS DAY. 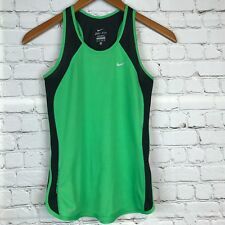 NIKE #599009 DRI FIT MOISTURE WICKING SLEEVELESS WOMENS SIZE LARGE FAST SHIPPING FROM CENTRAL LOCATION. GENERALLY SHIPS THE SAME BUSINESS DAY. Slight color shift may occur due to normal variations in computer screens. Chest (underarm to underarm): 19“. Length: 25“. Color: Black. NIKE DRI FIT MOISTURE WICKING SLEEVELESS WOMENS SIZE LARGE FAST SHIPPING FROM CENTRAL LOCATION. GENERALLY SHIPS THE SAME BUSINESS DAY. NIKE DRI FIT SLEEVELESS WOMENS SIZE: EXTRA SMALL FAST SHIPPING FROM CENTRAL LOCATION. GENERALLY SHIPS THE SAME BUSINESS DAY.